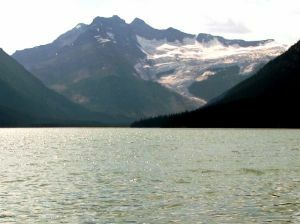 A double headed summit which towers at the end of the valley of Glacier Lake, and separates the Lyell Icefield from the Mons Icefield. The summit has two peaks, which can be readily ascended from the Mons Icefield as part of a Lyell-Mons traverse. Ropes are useful, mostly for the glacier. Name Notes: Named by Charles D. Walcott in 1919.